Driftwood Cottage is an amazing home tucked into the quiet Lakeshore Cottages neighborhood in Union Pier, Michigan. This impeccable and spacious modern cottage has plenty of room for large families, large groups, or multi-family vacationers and all the amenities you need for a comfortable and relaxing vacation, including access to an association club house which offers a heated pool, basketball court, and game room with ping-pong table, as well as close proximity to the public beach. On the main level, guests enter into a large open concept living space which seems even larger due to the soaring vaulted ceilings and numerous windows. The large chef's kitchen is fully equipped with stainless steel appliances and tons of counter space. A long dining table with seating for 10 will accommodate large groups comfortably. The living room features an L-shaped modern couch which surrounds the gas fireplace and flat screen TV. From the living room guests can access the fully furnished wrap around screened in porch. Three bedrooms, two bathrooms, as well as the laundry facilities are also located on the main floor. The first bedroom is a suite and is furnished with a queen bed and includes an en suite full bathroom, the second bedroom has a full bed, and the third bedroom is furnished with a queen bed and has direct access to a hallway bathroom, which features a gorgeous step in shower. On the upper level is a cozy sitting area overlooking the main room, and two bedrooms. One of the bedrooms is a suite with a queen bed and en suite bathroom. The other bedroom has a queen bed and direct access to a hallway bathroom. Over the garage sits a private sleeping room which is perfect for older children as it is furnished with leather couches, bean bags, flat screen TV, and two twin over twin bunk beds. This room is accessible from the main entryway of the home. A large grassy back yard offers guest plenty of outdoor space for grilling and enjoying the beautiful Michigan summer days and nights. 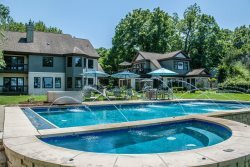 Close proximity to the surrounding towns of New Buffalo, Three Oaks, and Harbert offer guests multiple restaurants, breweries, wineries, and shops for the adults as well as parks, trails, public beaches, and a splash pad for the kids. If space and comfort are what you are looking for, you have found it at Driftwood! IMPORTANT NOTE: If you are booking the home between the months of September-May please verify with the agent that the hot tub and or pool will be accessible. Jon and Dan were extremely helpful in helping us find a second house to extend our stay. Whole family had a great time. Community pool was very convenient and we used it frequently. We absolutley loved the house. It fit our groups needs perfectly.